Anyone who walked the aisles of SME's recently concluded Rapid + TCT event in Fort Worth, Texas could feel the momentum that metal 3D printing is currently riding. 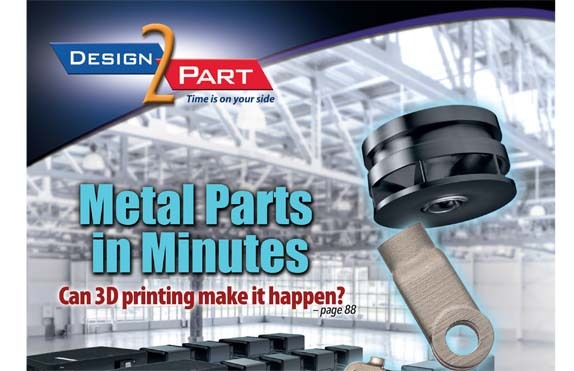 The promises of 'metal parts in minutes" were impossible to overlook, as companies pitched their abilities to make that happen in various ways. But when all is said and done, how realistic is it to expect that we can have 'metal parts in minutes?" It's one thing to quickly produce a metal 3D printed part for prototype purposes. But the more intriguing question, one that has captured the imaginations of manufacturers across a wide swath of industries, is 'How close are we to mass production of metal 3D printed parts that are not just produced quickly, but meet quality standards?" Although no one knows for sure, we're seeing some encouraging signs. Metal 3D printing, a multi-disciplinary process, has come a long way from the big, expensive machinery of years past. It's now benefiting from a host of innovative advancements in materials, software, and machinery, made possible by smart engineering and business acumen. Multiple companies have announced plans to begin shipping metal 3D printing machines in the not-so-distant future. Many of those machines will arrive with the promises of faster printing speed—higher throughput—and lower costs of materials. "If you look at the cost of parts in manufacturing, most of the cost is in the materials," said industry analyst Terry Wohlers, in an interview with Design-2-Part Magazine. "Materials cost is almost everything, for both polymers and metals." But until customers have had the opportunity to test the machines and confirm the validity of the manufacturer's claims, a fair amount of skepticism will remain. In the meantime, the jury is still out on the pricing of the materials. Companies like Desktop Metal, Carbon, and HP will have to get their material pricing right, said Wohlers, and if they don't, they'll be hurting themselves. "They know that the only way they're going to be successful is for their customers to be successful," said Wohlers. "If the material pricing is too high, then they're going to limit growth. They're going to limit the number of applications, and I think they know that." Some new metal 3D printing processes are using materials, such as powders for metal injection molding (MIM), from existing supply chains to lower costs in multiple ways. Not only are the materials themselves less expensive than those used in laser-based metal additive manufacturing, but the fact that their properties are well understood by engineers makes it much easier and less expensive to mass produce those parts using such processes as metal injection molding, stamping, or machining. It turns out that the microstructures of parts made by laser-based metal additive manufacturing are not what engineers are used to seeing in parts produced via the more traditional manufacturing processes. Metal parts that have been stamped, cast, or machined have microstructures that are much different from those of their laser-based metal 3D printed counterparts. Why? Melting a metal powder (transforming it from a solid to a liquid) and then bringing it back to a solid form, which is what happens in laser-based metal additive manufacturing, will create a whole new microstructure. Interestingly, these differences in microstructure have far-reaching impacts. Not only have they made it painfully difficult to qualify metal additive parts for their applications—just ask GE—but they've also made it cost-prohibitive for all but the deepest-pocketed companies to shepherd those parts into mass production. Why? If traditional mass production processes, such as casting or metal injection molding, cannot duplicate the microstructure of a metal 3D printed part, then the only way to mass produce that part is to scale up the metal 3D printing process. And if the metal 3D printing technology isn't capable of high-volume production on its own, then scaling the process means buying more machines to produce identical parts. That gets expensive very quickly, and it's why we don't see many companies going that route. So if a company or companies can successfully bring to market a metal 3D printing system that proves to be individually capable of reliably producing parts in high volumes, it would be a huge breakthrough. Manufacturers would no longer need to keep buying more and more of the same metal 3D printing systems to mass produce a part with repeatable properties. "Metal parts in minutes" would indeed be a reality, one that would signify a major change in the way that metal parts are manufactured. Metal 3D printing has something else going for it, too. The likelihood of overcoming intractable obstacles increases significantly by harnessing the brainpower of a diverse set of experts. And as a multi-disciplinary process, metal 3D printing enlists the raw talents and highly developed skills of people in disciplines spanning everything from hardware design and manufacturing, to software, materials, electronics, and machinery. Top companies in the field almost invariably have strong engineering teams that include industrial engineers, mechanical engineers, electrical engineers, software engineers, and experts in materials science and metallurgy. Conceivably, innovations in any one of these disciplines could have a sizable impact in moving metal 3D printing forward and enabling more widespread use. But the potential for accomplishing real breakthroughs increases exponentially when diverse experts work as a cross-functional team. Turning cross functional teams loose on the pain points specific to metal additive manufacturing dramatically increases the potential for developing further advancements to existing technology or inventing a whole new technology. And that's often what it takes to achieve breakthroughs that open up new worlds of opportunity.